Which dish of noodles is your life worth? German video artist Isabella Greeser directed this poetic documentary film about Han. The first part reflects upon the film Der Himmel über Berlin, directed by Wim Wenders and written by Peter Handke, perhaps because it’s Byung-Chul Han’s favorite film. Müdigkeitsgesellschaft–Byung-Chul Han in Seoul/Berlin had its world premiere on February 9 at the Centre de Cultura Contemporània de Barcelona (CCCB). A few hundred people attended the show. 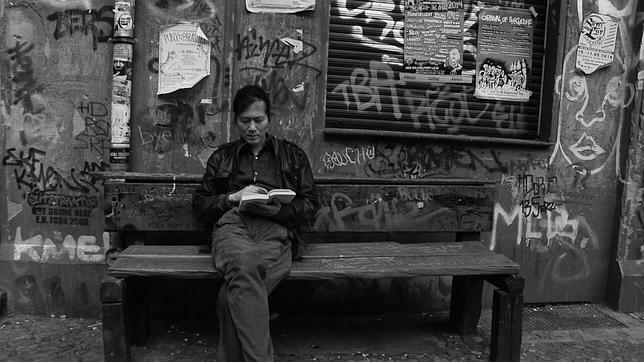 Byung-Chul Han is popular not only in Germany, but also in Spain, where five of his books have been lated into Spanish. Han’s thesis is that today’s neoliberalism has made politics psychological, or mental. The logic of neoliberalism has invaded our minds. This is sad, since our mind is all we have. It’s our ability to be present in our life, to think, and to love that is threatened by this invasion. We shrink mentally. More and more is said and done in the same, almost hypnotic and uncritical fashion. All that is strange, secret, or negative—in other words, all that passes through our thoughts—disappears, due to the ongoing repetition of sameness. It seems like all aspects of life suffer from the idea of “best practice,” so popular in business organizations. We lack a critical yet creative approach to overcome this confinement. Philosophy is an intervening time, he notes in Müdigkeitsgesellschaft (Eng. Fatigue Society). Philosophy can be understood as the time of “non-doing,” “a peace time,” as he calls it, in reference to Peter Handke. The concept of “non-doing” also resembles elements of mindfulness in that it stresses that we don’t need to be doing things constantly. Non-doing allows things to unfold at their own pace. Halfway through the film, Byung-Chul Han flies to Seoul, in South Korea. He was born there in 1959. In this part of the world, the relevance of the philosopher’s thesis and analysis becomes even more evident. People are exhausted. They sleep on the metro, on the busses, behind the cash register. It seems tragicomic. Those who are not sleeping live through the gleaming light of the ever-present cellphones. Do the cellphones work as pacemakers? In Transparenzgesellschaft (Eng. The Transparency Society), Han notes that we are forced or coerced into participating in ongoing positive communication: declaring, “I like,” over and over, again and again. However, we don’t have to like everything. Social media forces people to communicate more. No pause. Perhaps because updates and news drop down quickly, one needs to keep adding new communications in order to remain visible. A non-visible person is like a non-existent person. It is exhausting. This reminds me of French philosopher Gilles Deleuze, who once said that “art is not communicative, art is not reflexive. Art, science, philosophy are neither contemplative, neither reflexive, nor communicative. They are creative, that’s all.” However, in order to be creative, one needs to stop, allow oneself to be formed or touched by what is happening as it happens, without judging it according to some predefined ideal. Actually, I think that Han’s philosophy, like most forms of Buddhist meditation, tries to free us from the conventional illusion of having a self. Furthermore, unlike his German collegians at the Frankfurter School, Han is not normative in his critique, but immanent. This makes his approach more creative. Most of his critique is realized as practice. To stay with the vocabulary of Deleuze, then he points out liberating lines of flight that can change our relation to the world, for example, that it is ok not to do anything. Byung-Chul Han claims in Agonie des Eros (Eng. The Agony of Eros) that we (far too many of us, at least) have become narcissistic. I find it difficult not to agree with him. Like Narcissus, more and more people fall into the water and drown. Or life vanishes while people are Googling their own name. Or they jump off a bridge. South Corea is on the top of the list of countries with the highest suicide rate. In the film Han passes by a bridge in Seoul that is a popular site for suicides. Apparently, no one attempts to understand the depression that leads many to commit suicide. Rather, the sadness is covered up with quotes from poems alongside colorful pictures of delicious noodle dishes. Which dish of noodles is your life worth? Neoliberal capitalism has gone mad. Freedom has turned itself into a voluntary constraint on performance or achievement. Capitalism is like a train without brakes. We are exhausted; perhaps we need to embrace a tired society where it is okay to do nothing for a while. The Danish philosopher Søren Kierkegaard once wrote to his fiancé Regine Olsen that freedom is the element of love. If we follow Han, then today we are not free. Instead of love and compassion, we have stress, burnout, and depression. I guess it is time to take a break. Pause. Close your eyes. Breathe. Byung-Chul Han’s voice is both original and needed, and not just in Spanish and German. The documentary is a harmonic introduction to some of his thoughts and also provides some biographical information. Though it doesn’t add anything new regarding his ideas, it can serve as a supplement for those who still can’t find the time to sit down and read one of his short but stimulating books. For more about Buying-Chul Han, please, see here.